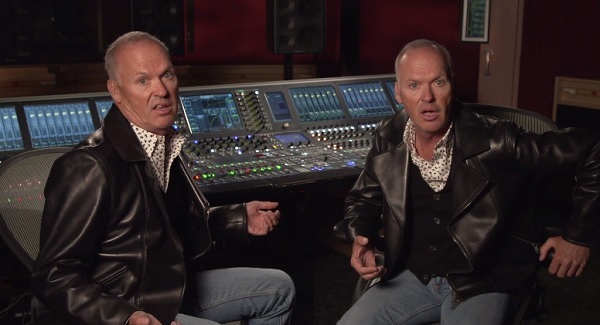 Because Michael Keaton started his career out as a stand-up comic – though not necessarily a successful one – he’s always been able to poke fun at himself over the years. And he does it several times in these new promos for his hosting gig for this weekend’s episode of Saturday Night Live, in which we get to hear him instantly bring back his Batman voice and brush off his Oscar loss. As you can see from the very beginning, we aren’t just dealing with any mere civilian Michael Keaton here; we’re dealing with Batman…and Cicely Strong. I’ll be pretty jazzed if the SNL writers mix some Batman humor in with the Birdman humor, although not having Danny DeVito around as The Penguin will be an emotional loss. The bit about him “getting robbed” was some pretty corny schtick, but it’s probably the most amusing way to handle that relatively uncomfortable situation. Remember when he already had his thank you speech out as Eddie Redmayne’s name was called for Best Actor? He probably needed a charm bracelet or three that night. Personally, my favorite part of the video is the Multiplicity reference, because dammit, that movie has always felt like an underrated gem to me, even if it was pretty stupid. And not even as stupid as the copy of a copy of a copy. That said, I’m not sure if Harold Ramis would have laughed at that joke. But I did, because two Michael Keatons are generally better than one. This will be Keaton’s third time hosting Saturday Night Live, and his first in over 20 years. He last offered his comedic stylings back in 1992 in promotion of Batman Returns. But let’s take a trip back even deeper into time to relive his very first SNL cold open in October 1982. Watch Keaton get back on the SNL stage with or without his cue cards, but definitely with special musical guest Carly Rae Jepsen, on Saturday, April 4. And don’t forget about the April 11 show, which will be hosted by Empire’s Taraji P. Henson, with musical guests Mumford & Sons.